Today I took a walk and found a nice Laundromat in Plaza Bahia. It is mostly a laundry service but had a sign Agua Fresca Naturales (more or less). So I went in and read the choices and asked for Strawberry. There was a nice couple working inside and they offered me Oatmeal Cinnamon. Seeing that was the best choice. I took it. Then I slowly drank it while visiting with them and cooling off after my long walk. 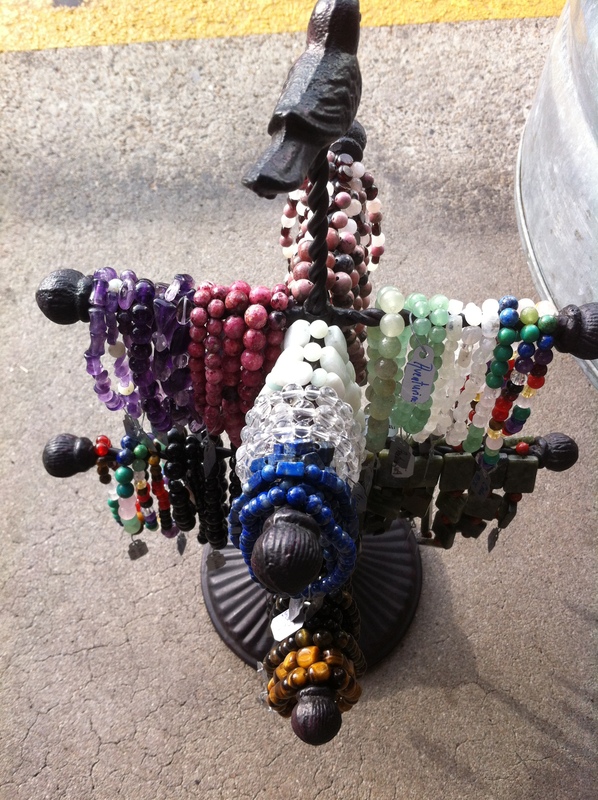 Then of course my business mind wandered and so I asked them if they might want to carry my bracelets. The stones have been cleared with Reiki, Sunshine and Sea Salt before I make them into bracelets both for my benefit and for the person who may purchase them. I was speaking in Spanish and, from experience, I knew the name for Amethyst and Turquoise so included those gemstone varieties in my explanation. They suggested the hair salon across the way had a lot of women customers and might be a better spot for me. I promptly visited the hair salon, and I now have the business card of that store’s owner, and of course I left my card too. Then I had fun meeting some other people from a restaurant, in the same small Plaza, that is opening tomorrow. The old sign says Pizza and Pasta, but the new business will be called “Pinocchio” . Perhaps I’ll play some music there with Jim someday. They did ask what our price was for performing, and I replied “We are flexible.” To which they looked pleased. These are at the Boise Coop!